Recovering from the loss of a family member is one of life’s most difficult challenges. Wrongful death is the term used when someone causes the death of another person. The death may be caused by the actions of someone or by their failure to act (neglect). Wrongful death is a civil action rather than a criminal action. Since the person killed (decedent) cannot file suit or collect damages, it is the family or representatives of the estate that do so. First in line are the surviving spouse, children, and surviving issue of deceased children of the decedent. These survivors can file separately or jointly. We do not live in a society that condones taking justice into our own hands or taking “an eye for an eye”. Unfortunately, there is no way to breathe life into the departed. The only means our justice system has to compensate a family for the loss of their loved one is monetary. Damages can be assessed for lost wages and benefits, loss of love and companionship, financial support, moral support of the Decedent and emotional pain and suffering caused by the trauma. While no amount of money can bring back your loved one, we will work aggressively to financially compensate you for your emotional, physical, and economic losses to the fullest extent of the law. We take action to compensate the wrongful death victim’s surviving family members and dependents for their financial as well as emotional loss. 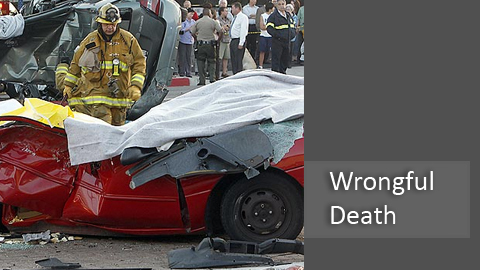 If you believe that you have a wrongful death claim based on the loss of your loved one, contact our wrongful death attorneys in Beverly Hills today at 310-331-8484 or 1-888-97-97-97-8 for a free case evaluation and to discuss your options.